Yay! The Kohl’s Cyber Monday Sale Online is LIVE! We have some new Kohl’s Coupons that you don’t want to miss because they mean AWESOME Savings! You can stack both of these codes for awesome savings + Kohl’s has reduced their Free Shipping Minimum to $25 so you can get FREE Standard Shipping on orders of $25 or more, or get FREE In Store Pick Up on any order. Here are some of the best deals I’m seeing right now, remember some of the name brand items exclude Coupon Codes! This American Tourister Luggage Set is priced at $64.00 on sale + use the coupon code NOV20 to save 20% off your purchase + Use the Coupon Code MONDAY to save another $10/$50 Purchase! You can get this World Tech Toys Striker Spy Drone with camera and remote control for only $59.99 + Use the Coupon Code NOV20 to save 20% and the code MONDAY to save $10/$50 Purchase if you just add another item! There’s a HOT Sale on these Women’s Tek Gear Hooded Packable Puffer Jackets, These are normally $100 but right now you can get them for just $34.99 at Kohls on sale. Buy 2 and Use both coupon codes NOV20 and MONDAY to pay as low as $22.99 each – or mix and match with other items in the Kohl’s Cyber Monday Sale! You can grab a great deal on the CHI Air 1″ Flat Iron, This is priced at $69.99 + You can use the coupon code NOV20 to save 20% + MONDAY Save $10/$50 Purchase = $45.99 + Get FREE Shipping! 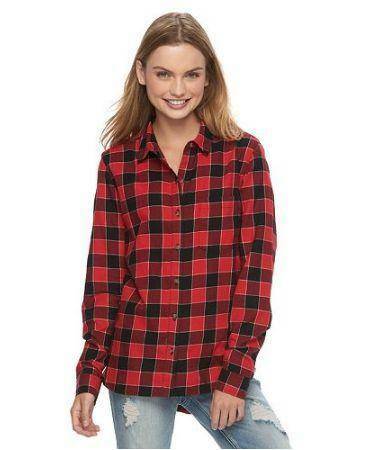 Flannel Plaid Button Down Shirts – $6.39! These Juniors Flannel Plaid Button Down Shirts are priced at just $7.99 + Use the coupon code NOV20 to save an extra 20% making them just $6.39 each! You can get this Step 2 Create & Bake Kitchen on sale for just $69.99 down from $140! + Use the coupon codes NOV20 and MONDAY to pay as low as $45.99 which is an awesome price! You can grab a great deal on the Biddeford Heated Plush Throws, These are already marked down half price from $79.99 to just $39.99. Use the coupon code NOV20 to save 20% off your purchase + the code MONDAY to save another $10/$50 Purchase. Buy 2 and pay as low as $26.99 each! Women’s Moccasin Slippers – $7.99! The Women’s SO Moccasin Slippers are marked down from $24 to just $9.99 + Use the Coupon Code NOV20 to save an extra 20% and pay just $7.99! You can get this Kids Tent for only $34.99 (Was $99.99) + Use the Coupon Code NOV20 to save an extra 20% off your purchase making it only $27.99! That’s just the beginning, there are so many amazing deals going today when you stack the Kohl’s Cyber Monday Sale with these Hot New Coupon Codes! Shop the Kohl’s Cyber Monday Sale Here! HOT Price on a 32 Piece Magformers Magnets in Motion!